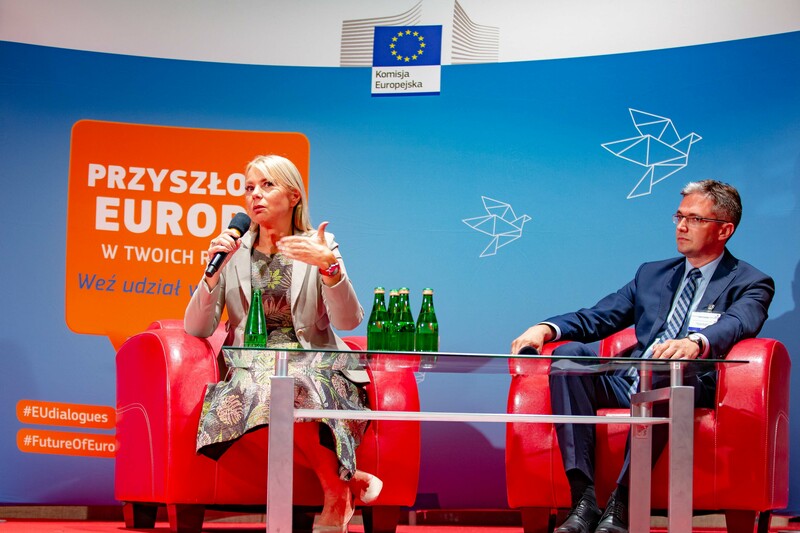 On 6 September Elżbieta Bieńkowska - the EU Commissioner for Internal Market, Industry, Entrepreneurship and SMEs, participated in a Citizens' Dialogue in Kielce, Poland. The event took place within the International Defence Industry Exhibition. For almost 100 people it was an excellent opportunity to ask many questions about the details of the European Defence Fund as well as on the future of Europe. Commissioner Bieńkowska said that for the first time ever, the EU is now talking about concrete cooperation between the Member States on research and common purchases within the defence market. „We want to help Member States to spend money more efficiently and reduce duplications in spending“ she declared. For many stakeholders representing the defence market, it was clear that EDF means an opportunity for the Polish defence industry. Participants wanted to know the details of the procedure, deadlines and available budget. It was important for them to hear that the whole project envisages close cooperation between the government, industry and researchers. "The EU should not compete with NATO in the area of defence policy - one participant underlined. This programme is not designed contrary to what NATO does. We cooperate with NATO very closely", the Commissioner replied. She also stressed that in the next EU budget, the EU defence policy will be well represented. One of many questions from the public concerned threats that companies may encounter in obtaining additional funds from the fund, bearing in mind the current low profile involvement from the Polish government. „We do not see sufficient involvement from the Polish side.“ she admitted. Commissioner Bieńkowska explained that first pilot projects in the research area will be evaluated by the Commission in January 2019 and then it would be clear, who is really interested. Participants also asked about the situation of Poland's eastern neighbors, mainly Ukraine. Attention was paid to the need to support Ukraine's efforts with a clear focus on assistance from Warsaw. Likewise, during her previous couple of Citizens’ Dialogues in Poland Elżbieta Bieńkowska shared her views on the situation in Poland. Once asked about the article 7 and the rule of law procedure, she said that at the same time we have started talks about the future EU budget.